Dallas, Texas, November 2018 – The IRS has announced its 2019 cost-of-living adjustments to tax items that might affect you. Many of the amounts increased to account for inflation, but some remained at 2018 levels. As you implement 2018 year-end tax planning strategies, be sure to take these 2019 adjustments into account in your planning. Bear in mind that, under the Tax Cuts and Jobs Act (TCJA), annual inflation adjustments are now calculated using the chained consumer price index (also known as C-CPI-U). This increases tax bracket thresholds, the standard deduction, certain exemptions and other figures at a slower rate than was the case with the consumer price index previously used, potentially pushing taxpayers into higher tax brackets and making various breaks worth less over time. The law adopts the C-CPI-U on a permanent basis. 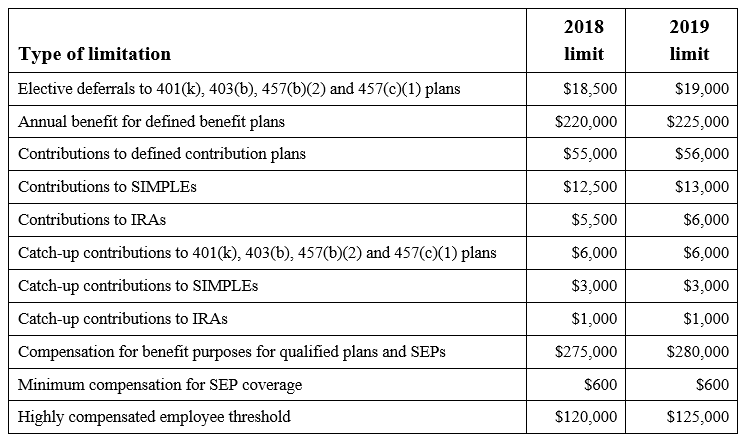 The TCJA suspended personal exemptions through 2025. However, it nearly doubled the standard deduction, indexed annually for inflation through 2025. For 2019, the standard deduction is $24,400 (married couples filing jointly), $18,350 (heads of households), and $12,200 (singles and married couples filing separately). After 2025, standard deduction amounts are scheduled to drop back to the amounts under pre-TCJA law. The annual gift tax exclusion remains at $15,000 for 2018. It’s adjusted only in $1,000 increments, so it typically increases only every few years. It increased to $15,000 in 2018.